Sew Cute: Lilly Sale Recap! Hello lovely people! If you know anything about me, you know that I love Lilly Pulitzer and a good sale. So, naturally when the After Party Sale rolled around I was armed and ready to score some good deals. In previous years the site has crashed and I came out empty handed. But, this year I hit the jackpot and was able to get a lot of great pieces that I know I will wear a lot! So, sadly I won't be able to get a big chunk of my stuff because I will already be in London when the package arrives at my doorstep. But, I did shop in store and online so I got to bring three pieces on my London adventure! For now, I will show you some images of what I got but sadly they are not styled on me. So, here is my Lilly Pulitzer After Party Sale haul!!!! These are all the pieces I purchased online! I am in love with flamingos so when I saw two flamingo prints on sale I kind of went crazy. I got this adorable shift dress in addition to an adorable casual tank top. Skorts are my favorite. I am IN LOVE with my navy Lilly skort I bought a while back so I knew I wanted to get some other ones! I picked up an adorable asymmetric pink seersucker skirt perfect for pairing with button downs or tees. Also, I picked up a fun printed one perfect for the spring and summer time. Also, I plan on wearing all of these pieces while I am in Florida for winter break! Cute, casual, and comfortable! 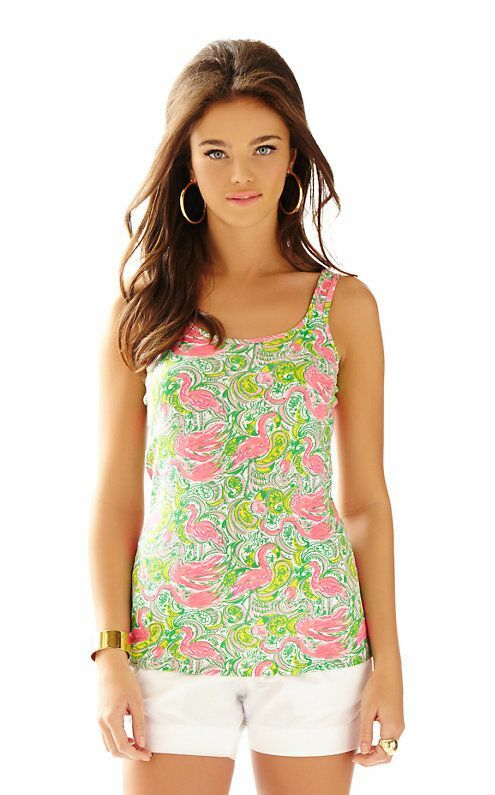 I love Lilly's tanks. Recently I bought a giraffe tank which is perfect to pair with chinos or a J Crew skirt. Ugh this black dress! I am in love with it! For only $59 marked down from $188 I thought it was a great steal. I love this dress because you can basically wear it all year long. The rest of the pieces I picked up in the store included two adorable elephant printed dresses one in a shift dress then the other in a casual three quarter sleeve dress. Then I also got a three quarter length sleeve top with a fun pink, white, and blue print. But, I didn't have time to take pictures in these pieces before I packed them up for London. However, you will see these pieces in future looks so be on the lookout! Here is the shift dress with the elephant print. I wore it to a dinner with my boyfriends family for his last day in town before he headed back to school. Also, I couldn't wait to wear the dress so naturally I wore it the day I bought it! What did you pick up at the Lilly After Party Sale? Let me know in the comments or tweet me pictures at @Mirberry_! Wow you definitely hit the jackpot! Lovely picks! !